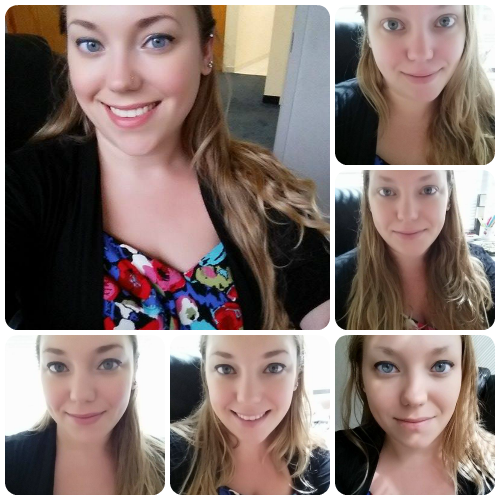 My face does not always look like how it does on the days I post a #FOTD or #OOTD. My face likes to make demons, my skin gets a little red, and a lot of the time I'm wearing my glasses. My everyday routine usually includes grabbing the makeup I want to wear from my bathroom and tossing it into my makeup bag, so I can hopefully put it on at my desk at work. 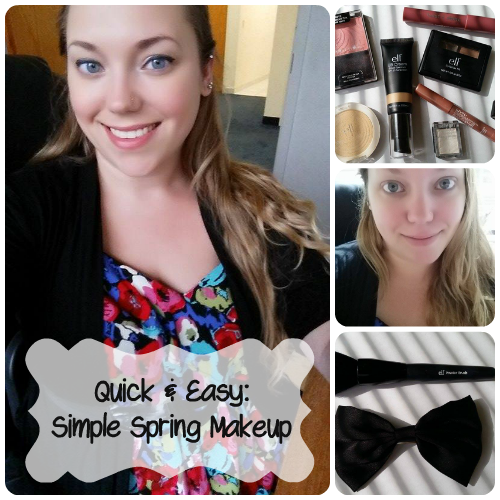 Since it's Spring and the weather is hopefully warming up where you're at, I'm going to show you my Spring every day #FOTD. Messy office desk, crappy lighting, and all. I completed this look with just 8 items and a single brush! Starting at the top right is my blank face- no makeup no nothing. Just my raw face from the night before. I have a little bit of redness on my nose and cheeks. But nothing too bad. I applied the NYX shadow stick and liquid liner to my eyes. I usually actually do my brows next but I went a bit out of order than I usually do today. The shadow stick is a quick and easy way to pop color on the lid and its subtle enough that its appropriate for both work and school. Next I drew some brows on my forehead and popped a little bit of blush on my cheeks. The large picture is the completed face a couple hours later while I was working on a coworkers computer. 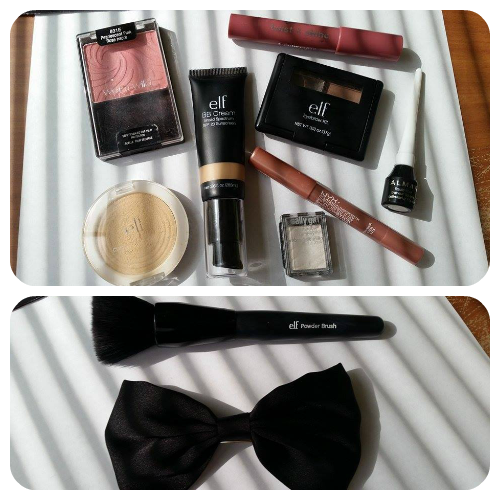 Its a simple look for everyday and it can be easily molded into anything! I like this look because it involves no highlighting/contouring and still makes me feel pretty. I picked a BB cream because it is starting to get so hot outside and the sun is being unforgiving. This particular BB cream has an SPF of 20 - which is amazing for this Florida sun! No seriously, let me know if you try this look! Was sold by words "quick & easy". I never seem to have enough time in the mornings to put makeup up. Your look is cute & flawless. Thank you! The longest this look takes me in the morning is 15mins. And that 15 mins is well worth it to feel good about myself for the rest of the day! its such a simple and pretty look! I'm not great with make up, so I'm definitely following your steps/tips! Seriously the shade stick has been a life saver! Smudge that all over my eyes and it looks like I actually tried! && I usually just close the door to my office when I'm taking my selfies! haha!